Due to energy security concerns, President Obama has called for bringing one million plug-in hybrid electric vehicles on the road by 2015. To make this a reality, we must prepare the smart grid for this plug in hybrid electric vehicle load. If we get a million electric vehicles on the road the impact in areas like California and the Northeast, where they’re going to be sold, will be dramatic. Managed charging is not a desirable, it’s a critical, mandatory thing we’ve got to achieve. The upgrade to the 240V/30A connection that is needed for "fast charging" is going to cost roughly $1500-$2000 per home, but guess what? Anyone that buys an electric vehicle is going to want one of these outlets. We live in the age of broadband, and nobody is going to accept the charger equivalent of a dial-up connection for their car. We have to expect that these loads increasingly will be part of the overall equation; it is only through smart grid technologies and systems that we will have a chance to flatten the overall load curve in attempting to keep electricity affordable and meeting our other societal commitments in the face of skyrocketing EV charging loads. Utilities will need to have real-time insight into what is happening on their distribution grids down to the transformer level. Having some kind of Distribution Management System (DMS) in place will be the only way grid operators will be able to spot, or to know in advance, if a circuit is overloaded or experiencing any difficulties that could lead to wider disturbances. A mass rollout of EVs without smart grid would be inviting serious trouble. How can we maintain the reliability of the electric system if we have a million plugged-in electric cars drawing electricity off the system at different hours of the day? How do we provide incentives for vehicles to charge during off peak hours? Is it a simple price signal or something more? The Electric Vehicle probably represents the highest unpredictable residential load. 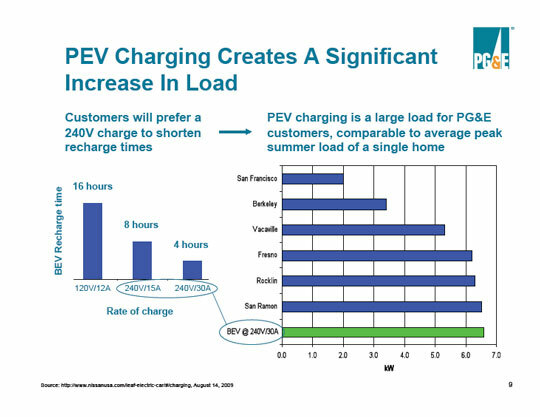 This is a challenge as the consumer will want to choose when to charge (or when charging should be complete) and the utility will want to manage the load per transformer, especially as we move towards fast charging. This requires intelligence and prioritization both in the EVSE and the meter while making it transparent to the user. Without an integrated communications infrastructure and corresponding price signals, handling the increased load of plug-in hybrids and electric vehicles would be exceedingly difficult and inefficient. Smart Chargers, enabled by the Smart Grid, will help manage this new energy device on already constrained grids and avoid any unintended consequences on the infrastructure. PHEV add a significant load, but it is comparable a typical household. Typical U.S. households consumed approximately 11,000 kWh annually in 2001. The addition of a PHEV with 5–10 kWh of useable battery capacity that is charged once per day could add an additional 21–43% (2200–4600 kWh) per year to the household electricity load, comparable to average central air conditioning and refrigeration loads. EVSE - Electric Vehicle Service Element - The EVSE provides the direct interface with the PEV, including a charger and information exchange capabilities. The charger can either be on-board the vehicle or off-board. On-board chargers require AC energy transfer to the vehicle (either 120 or 240V single phase) and Off-board chargers are within the EVSE. In addition to the safety concerns, EVSEs will, depending on their level of intelligence, ease the integration of plug-in vehicles into the grid and offer consumer benefits. Simple EVSEs can control charging start time. More complex units enable variable charge control based on pricing or grid loading process user identification and payment; handle vehicle-specific metering; enable vehicle diagnostic reporting; and in the future will control vehicle-to grid capacity, among many other novel, and as yet unimagined functions. Green Charging - Linking the electric vehicle charging to renewables production. The people who buy electric vehicles are going to be people who are motivated to reduce their personal carbon consumption, so they’ll be the kind of folks who would want to run their car with renewable energy. So how do we somehow? One of the Detroit automakers is looking into contracting for wind farms. And in the dealership, when you go buy the car, they’ll ask you do you want to sign up for our wind farm? They are not expecting to make money off the energy, but are promoting the value to the consumer of the car. Grid-Aware Vehicles -Communicate driver requirements, battery requirements, SOC, etc. Grid and external inputs Schedule charging per driver, grid needs. HomePlug Green PHY - A new specification that is a subset of HomePlug AV and is specifically designed for the requirements of the smart grid market. It has peak rates of 10 Mbit/s and is designed to go into smart meters and smaller appliances such as HVAC/thermostats,, home appliances and plug-in electric hybrid vehicles. so that data can be shared over a Home Area Network (HAN) and back to the utility. For these applications, there’s not a great need for high capacity broadband; the most important requirements are for lower power, robust, reliable coverage throughout the home, smaller size and less costly Bill of Materials. GreenPHY uses up to 75% less energy than AV. The HomePlug Powerline Alliance worked closely with utilities and meter manufacturers to develop this 700-page specification (downloadable from the HomePlug website). HomePlug Green PHY-based products will be fully interoperable with products based on HomePlug AV, IEEE 1901 or the upcoming HomePlug AV2 specification. In October 2011, Audi, BMW, Daimler, Ford, General Motors, Porsche and Volkswagen agreed to use HomePlug GreenPHY as the communication protocol for smart charging. This approach will facilitate integration of the electric vehicle into future smart grid applications. IBP - Increasing Block Pricing - May discourage PV adoption, The current IBP schedule does not account for energy savings and environmental benefits that may be gained from fuel switching from gasoline to electricity. Orphaned Charge - A device that incurs a cost at a premise other than its registered, “home” premise and generates a billing charge to be reconciled through the Utility System. This term refers to proper premise association. For example, a plug-in hybrid that charges at a grocery store or a friend’s house. SAE – Society of Automotive Engineers - Publishes automotive related standards in North America. SAE J2836/1: Use Cases for Communication between Plug-In Vehicles and the Utility Grid. The standard, published in 2010, establishes use cases for two-way communication between plug-in electric vehicles and the electric power grid, for energy transfer and other applications. It also provides a set of communication requirements for use with various load management and rate programs that will be established by utility companies related to the charging of plug-in electric vehicles. The various utility programs will enable consumers to charge their vehicles at the lowest cost during off-peak hours, and helps the utilities reduce grid impacts by minimizing electric vehicle charging during peak periods. SB 626 (Kehoe) Electrical Infrastructure Plug-in Hybrid and Electric Vehicles - This law passed in 2009 requires the CA Public Utilities Commission, in consultation with the CA Energy Commission, the CA Air Resources Board, electrical corporations, and the motor vehicle industry, to to develop infrastructure sufficient to overcome any barriers to the widespread deployment and use of plug-in and electric vehicles, and to adopt rules by July 1, 2011, on specified matters, including infrastructure upgrades necessary for the widespread use of plug-in hybrid and electric vehicles. Trickle Charge - A method of recharging in which a secondary battery is either continuously or intermittently connected to a constant current supply that maintains the battery in a fully or near full charged condition. Typical trickle charges are between 0.03C and 0.05C. V1G – Grid to Vehicle One Way Communication - Utilizing Electric Vehicles in demand response include providing proportional charge rate signals. 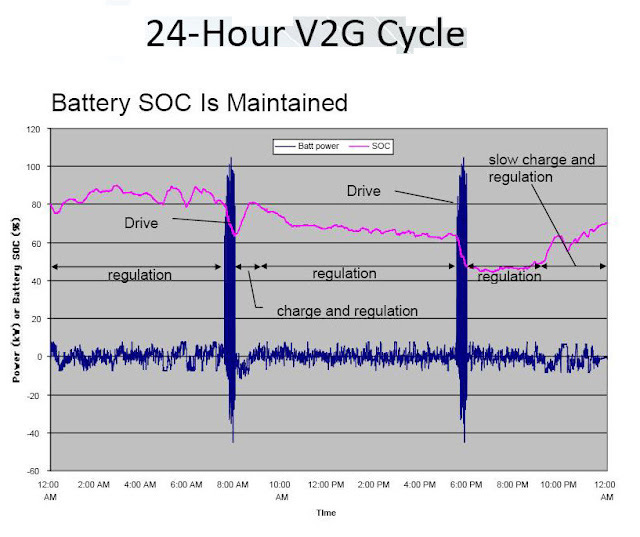 V2G –Vehicle to Grid - Letting the vehicle take and give power back to the grid Electric utility may be willing to purchase energy from customer during periods of peak demand. V2H - Vehicle to Home– Linking the car to house rather than the grid. This potentially provides three benefits: it obviates the issue of exporting energy back to the grid; can reduce demands on the grid as a supplementary supply to the house; and could also provide emergency backup in the event of power outages. V2L - Vehicle to Load - Use of the PEV storage to provide power to a remote site or load that does not otherwise have electrical service. Examples include construction sites or camp sites. Analyst John Gartner of Pike Research anticipates that a growing need for “intelligent management” of electric vehicle charging will create a $297 million industry in the U.S. as of 2015. That forecast encompasses the market for tech ranging from applications, servers, networking equipment and other hardware, to ongoing services for collecting and monitoring data about vehicle charging. Globally, he expects revenue from EV management to climb to $1.5 billion in 2015, up from $383 million in 2010. Widespread consumer charging of PHEVs during peak periods in the day, for example, could increase peak load and increase utilities’ operational costs. The development of a Smart Grid is therefore vitally important to utilities, since it entails the intelligence to send signals to consumers on when to charge their vehicles or provide differentiated rates to encourage off-peak charging. In the new world of plugs-ins, your car should be able to sell energy you don't need back to the grid during times of peak power demand, such as in late summer afternoons, when both office buildings and homes are running air conditioning. Today, that peak demand is served by older, usually dirtier and less-efficient "peaker" generators that utilities fire up when needed. A national fleet of a million or more EVs, most sitting idle roughly 90 percent of the time, could serve as a massive national storage device that can be tapped as needed to meet peak demand. The customer connects their PEV to the energy portal at another premise. The premise customer pays for the energy use. The customer connects their PEV to the energy portal at another premise. The PEV customer pays for the energy use directly with the utility, such as with a credit or debit card. In this scenario, the customer would get billed at the rates in their PEV tariff. The customer connects their PEV to the energy portal at another premise outside the enrolled utility's service territory. In addition to the previous 2 scenarios, the customer could become a “guest” of the external utility and pay rates as such a guest, or could indicate the PEV program they are enrolled in at their “home” utility, and pay those rates. The external and “home” utilities would then make a settlement between them on any differences. The customer with a PEV that is not enrolled in any program (or cannot prove enrollment) connects their PEV to the energy portal at another premise. Either private party arrangements would be needed (first scenario) or “guest” arrangements (third scenario) would be used for payment. The customer connects their PEV to the energy portal at a public location, multi-family dwelling, or workplace infrastructure. Either private party arrangements (first scenario) or direct utility interactions (second scenario), or “guest” arrangements (third scenario) would be used for payment. This kind of intelligence can be enabled by the Electric Vehicle but participation of a Clearing House and a nationwide effort on a common standard is also needed. Utilities need to be able to manage vehicle charging as with other major smart appliances (home A/C, pool pumps, refrigerators, etc.) and to verify the PEV load –to implement Smart Charging. The automotive and utility industries have agreed for PLC- (power line carrier-) based wired interface to be the physical interface between the PEV and the AMI/HAN, with the PLC(HomePlug AV or IEEEP1901 are the currently adopted technologies) transceiver chipset and associated Smart Grid communications “application layer” software with requirements defined by SAEJ2836/J2847 and SE2.0, residing onboard. That would include a PLCto X bridge residing off-board, with X being the transport layer of the AM I/HAN network, which also implements SE2.0- based messaging as the application layer. EPRI estimates the per-vehicle cost overhead for PLC transceiver is about $20 per vehicle in the near term, reducing to $10 per vehicle longer term, as PLC is already a very widely deployed technology. On the PLC to X bridge aspect, the X in most cases is ZigBee, but WiFi (802.11x-based) is also rapidly emerging as the HAN contender. The per-unit PLC/ZigBee or PLC/WiFi chipset prices vary between $10 and 20 per unit as well. Fast Charging- Simultaneous fast charging of a significant number of EVs, directly from the grid, will impact on the grid and local distribution particularly at the peak generation period. Fast Charging equipment can charge at up to 500V and 125 amps, or 62.5 kilowatts (kW). Charging just one vehicle at this rate is equally to approximately 43 vehicles being charged via Level 1 (aka standard household current) or 9-18 vehicles at Level 2 using charging equipment. Complicating matters is that DC charging is by necessity immediate – delaying a 15-30 charge defeats the entire purpose. Plus, these charge locations are likely to be at truck stops, gas stations, or mini-marts, which aren’t places that most folks plan on spending a lot of time. While DC charging is a much bigger drain on the grid, charging stations won’t ordinarily be placed to impact residential transformers or transmission lines But if fast charge spots are connected to substations that experience peak demand, the potential for making a bad situation worse exists. For example, in California, the average peak demand per household in most service territories is between 1.3 and 1.9 kW, so one DC charging station is tantamount to about 30-45 houses. Fast charging stations will need to be planned to reduce any grid impacts, and located in areas where distribution networks can cope or are able to be reinforced. An alternative is to provide local energy storage (e.g. batteries or flywheels) at the charging station. These could be trickle charged from the grid at times of low grid utilization, and provide high energy transfer rates direct from the local storage. The capital cost of the charge stations is likely to be higher using this technique, although this could be balanced by the reduced need for grid reinforcement. 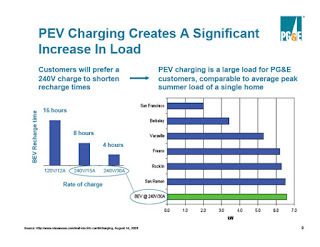 If a consumer wants to charge her EV at 4pm on a hot afternoon, is a fast charge permitted at a full rate, partial rate (and how does that impact how much she pays? ), or is it delayed? Whatever the choice, someone’s not going to be happy. Local Power Distribution Issues - There’s plenty of aggregate power capacity, but not in local areas. Five plugged in PEVs on the same street plugged can create a problem. They also need to verify and measure value –utilities want to pay incentives for verifiable conformance to load management programs. EVs are likely to be owned and used in city centers. These clusters of EVs could potentially all connect to the grid simultaneously, which may require the local distribution system to be reinforced. A detailed analysis of the local situation regarding distribution should be carried out in these areas, along with a series of pilot studies to assess the real-life effects of vehicle charging. Consumer Preferences - For consumers the preferred time (without any incentives to change their preference) is likely to be as soon as they are within easy access of a plug. This is both most convenient since they are at the vehicle already, and also improves their options since they may need the vehicle soon and would prefer a more fully charged battery. Regulatory Constraints - Currently regulations do not permit electricity to be resold. This means that all the accounting and settlement issues must be handled by utilities (or energy service providers) without the middleman reseller as is the normal market method. This puts the burden on the utility to manage the complex accounting and settlement processes usually handled by credit card companies or other retail accounting providers. However, if regulations were to change to allow the unbundling of electricity so that stored electricity could be resold, then the accounting model would change dramatically, since normal retail methods could be used. Pricing Constraints - The current IBP schedule does not account for energy savings and environmental benefits that may be gained from fuel switching. Households using PEV's would be increasing their overall energy efficiency and conservation through switching from gasoline to electricity. Mobile Billing — it may be one thing for me to charge my EV at or near my home in El Cerrito. But what if I drive to Reno? Will I be able to buy and sell electricity in another state — or even another utility district in my own state? Much like the early days of cell phones, where calling from outside one's home territory resulted in onerous fees — remember roaming charges? — there's the potential for EVs to lose their luster if they can't affordably do buy and sell power wherever you go. Visibility - PHEV and EV load is behind the meter and there is currently no separate measurement and control. Dynamic Pricing - TOU rate, Demand Response, and Real Time Pricing signals Enabled through AMI would allow customers to recharge vehicles at reduced cost during off-peak hours. Communication of utility rate tariffs to the customer. Bi-directional Metering - Allows customers to purchase energy at off-peak hours and sell unused, stored energy back to the utility during peak periods at higher rates. Public Education - Can customers be encouraged to charge when it’s “best” for the utilities? Requires understanding consumer habits and market expectations. Model Impact of PEV’s on the Grid - Develop processes to model PEV impact on the grid operations along with impacts of other widespread distributed resource impacts (local storage, high penetration PV, demand response as a distribution resource, etc.) – NIST plans to work with DOE to explore the business and technical impact of these widely distributed resources (including aspects of PEV as highly portable demand/storage) on the grid with the objective of mitigating severe contingencies due to the widespread adoption and use of these technologies. Ensure that work includes transactional elements (settlement when charging/discharging away from “home”. Electric Motor Werks - San Carlos, CA - Founded in 2010. Designs and manufactures charging solutions for electric vehicles. The company offers its products under the JuiceBox Smart[Grid] brand name. It also provides grid management services including demand response, frequency regulation, peak shaving, and local load balancing. In January 2016, eMotorWerks announced that all three California investor owned utilities awarded demand response (DR) contracts to eMotorWerks for participation in the California Independent System Operator (CAISO) Demand Response Auction Mechanism (DRAM). The DRAM operates in the CAISO day-ahead market, and eMotorWerks will provide precise EV charging load curtailment from its expanding JuiceNet network of EV charging stations to the wholesale market. In addition to day-ahead market participation, JuiceNet resources will be able to participate in the CAISO real-time energy market. This marks the first aggregated EV charging station offering within the CAISO real-time energy market, providing another valuable resource to further benefit the electric grid in California. Ford - Has developed an intelligent charging system that previews how its production vehicles will interact with the grid. The unnamed system enables all-electric and plug-in hybrid vehicle owners to restrict charging to when electricity prices fall below a certain threshold, or even “when the grid is using only renewable energy such as wind or solar power,” according to Ford. In its ongoing testing of converted PHEV Ford Escapes, the company is leveraging communications systems it designed including SYNC, SmartGauge, and Ford Work Solutions. The vehicles are communicating with the grid through smart meters over a wireless network using the Zigbee protocol, but Ford hasn’t committed to a network platform for its production vehicles. Ford has lined up some impressive utilities to help with the tests, including Southern California Edison, American Electric Power, Progress Energy, and 10 others, which will each receive some of the test fleet. The agreement is to continue testing for three years, which is interesting because the company plans to have a commercial PHEV for sale in 2012 — you might think that testing of PHEV grid interaction would be moot at that point. Ford received $30 million in DOE grant money to pay for part of the testing. General Motors' ATOMS (OnStar Advanced Telematics Operations Management System) In July 2011, GM announced the launch of a pilot program that can let utilities and customers skip the need to install physical smart grid points to manage recharging of their EVs. The new OnStar service will act as a remote brain, wirelessly tracking and governing the EV's charging behavior, coordinating the timing and billing, and potentially dramatically lowering the costs to extend smart-grid management features to EVs. GM estimates that by skipping the need to install physical smart apparatus, the OnStar system can save utilities some $18 million per 1,000 customers. Since it doesn't matter whether the EV is connected to a smart-grid charge point, OnStar should let utilities more accurately model how to manage peak versus non-peak charging too. Demand response - OnStar will allow the utility to actively manage EV charging for those who opt in to the service. The utility can then reduce peak loads by offering discounts or other incentives to encourage drivers to charge their EVs when overall electricity demand is lowest, typically in the early morning hours. General Electric Digital Energy Atlanta, GA - General Motors’ OnStar announced at the Plug-In 2011 conference, that the company’s wireless vehicle communications platform is being connected to General Electrics’ Grid IQ Demand Optimization System. Data from thousands of Chevrolet Volt PHEVs will be made accessible to GE’s software, which is used by utilities for managing the load on the power grid. By enabling the platforms to share information in both directions, utilities can incorporate Volts into their existing systems for shedding load while studying customers’ driving and charging habits. An aftermarket version of OnStar, to be sold by Best Buy, was announced in July 2011, enabling owners of competing models to use the communications system. While other PEV makers are developing their own wireless communications platforms, new models could incorporate OnStar as their platform and gain access to GE’s utility platform as well.GE is purchasing 25,000 PEVs, including 12,000 that will be leased by its fleet customers, including utility companies (GE Finance has a large fleet business). The smart grid pilot program, which will start with one unannounced utility, will provide access to charging history – including location, time, and amount of energy consumed by the vehicle – and will be made available to understand how PEVs will impact the grid. GridPoint , Arlington, VA - Developing version 3 of its Smart Charging software (due to ship to customers in September) that will schedule and monitor vehicle charging while keeping track of the grid’s health. The software includes tools that enable utilities to understand how vehicles individually and in aggregate are impacting power demand. Utilities can compare recent vehicle demand on the grid with what would have happened with no control over vehicle charging to see how well their attempts at shifting the load are doing. 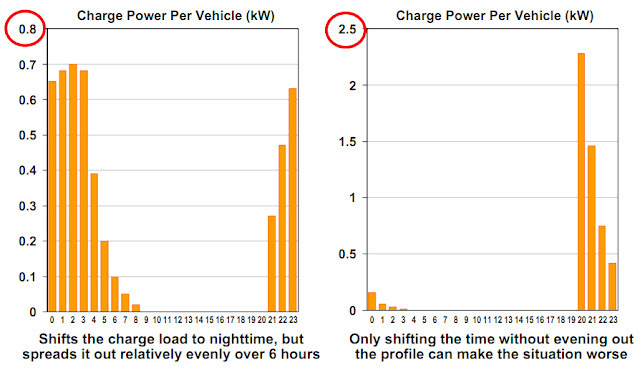 The Smart Charging software also provides day-ahead demand projections based on previous charging data. For over two years, GridPoint has been delivering the smart grid software utilities require to easily and cost-effectively support the wide-scale adoption of plug-in vehicles. GridPoint, Inc. received $15 million of VC funding in 2008 for their management of distributed storage, renewable generation, and load, bringing the firm’s total funding to over $100 million. Juice Technologies - Columbus, OH - A leading provider of products and technologies that enable the intelligent charging of electric and plug-in electric vehicles as well as products to optimize home and business energy use. Juice Technologies' products are sold under the brand Plug Smart and are distributed worldwide through electric utilities and the consumer electronics channel. In February 2010 GE and Juice Technologies announced a joint development agreement to create intelligent plug-in electric vehicle (PEV) charging devices for U.S. and global markets. The chargers integrate GE's smart meters with Juice Technology's Plug Smart(TM) engine to help consumers charge their cars during low-demand, lower cost time periods. IBM - has teamed up with Honda and Pacific Gas & Electric to test the communications between the Honda Fit’s onboard telematics and the utility’s back office. The pilot, which involves fewer than 10 real cars and more simulated scenarios, is investigating the connection between the car and the utility to receive messages about charging and grid events. The connection directly to the car, rather than through a charging station, adds another level of flexibility for the utility to be in touch with the roaming loads in their territory. IBM’s cloud-based platform connects through cellular to the car and also back to the utility. The pilot will test sending and receiving information about the battery state, which can then help create an optimized charging schedule. Although the issue isn’t critical for utilities today, if EVs take off in the market, utilities will have to manage their loads using more than just price signals. With this system, for instance, the utility system could know when cars have a low battery life to inform predictive load forecasting. PlugShare - Venice, CA and San Carlos, CA - PlugShare is a software and services company that provides guidance to drivers and industry to support the adoption and growth of plug-in car technology. While not a company that actually provides infrastructure, PlugShare wants to aggregate all the data for the electric vehicle charging infrastructure that is deployed across all providers. Silver Spring Networks, Redwood City, CA - Unveiled in January 2011 a prototype tomorrow of a charging station enabled with its technology for the 2012 Toyota Prius Plug-In Hybrid. The charging stations are made by ClipperCreek and are a part of a smart grid and electric vehicles pilot announced in July 2011, in conjunction with PG&E and Electric Power Research Institute. The pilot aims to integrate electric vehicle charging with Silver Spring’s smart grid platform, allowing for the charging station to relay electricity usage data to PG&E. From there, PG&E can monitor energy usage of the charger (looking at it separately from the energy consumption of the home), and also give consumers a snapshot of their charger’s energy use. This is probably the only way (still goo though) that a new ford escape hybrid would come out. I think it will require a massive info campaign to put into full effectiveness though. People still have the gas station mentality so they'd probably go rush it on rush hour and peak hours. Maybe the hybrid car manufacturers can help out too?